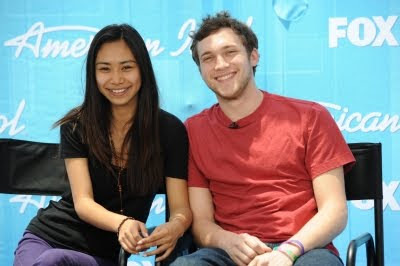 Jessica Sanchez or Philip Philips: Who Will Emerge as the 11th American Idol?! A neck-to-neck battle between the Top 2 "American Idol" Season 11 contestants had been witnessed! Our very own Filipina-Mexican Jessica Sanchez, the 16-year-old with the big, big voice fought face to face with Phillip Phillips, the 21-year-old bashful singer with a soulful edge. The breath-taking competition took place on the night of May 22 (May 23 in Manila). The two finalists performed three songs each - one of Idol creator Simon fuller's choice, one of the Idol hopeful's favorite performance of the season, and their coronation song, the one that will be released as their new single after winning American Idol. Simon Fuller chose the Whitney Houston's hit "I Have Nothing" for Jessica which opened the performance night. For Philip, the Ben E. King's song "Stand by Me" was chosen for him. On the second round, the two picked their favorite song for the season. Jessica chose "The Prayer," the song which got her to Top 24. Philip on the other hand prefer to sing "Movin' Out" (Anthony's Song) moment which was well praised during the Top 10 Billy Joel's night. Then on the third round which is their coronation song, Jessica sung "Change Nothing", an original song that will be released as her single if ever she won. For Philip, his original song "Home" was performed on this final round. After their performance on each round, the judges gave their comments. The crowd even showed their reactions. On the third round, we may recall that Philip got a standing ovation from the judges for his last performance (Home) and Randy Jackson claimed that it was the best of the night. Based on their performance and based on the reaction of the judges and audience, who do you think between Jessica and Philip will be hailed as the 11th American Idol? There is also an online voting currently on-going which is also another factor to determine this year's winner! Phillip last song is not an original composition!